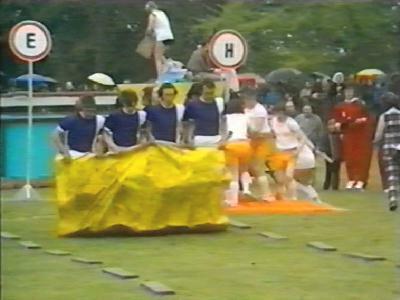 The television program It’s A Knockout was a games competition program broadcast in the UK on the BBC between 1967 and 1987, on S4C in the mid nineties, and then on Channel 5 in 1999 to 2001. What Was It's A Knockout ? 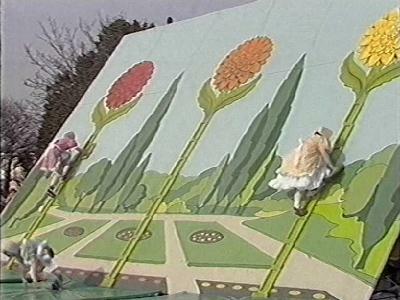 If you do not remember the tv show, in today’s terms it can be described as a colourful inter-town style Olympic games competition or a team version of Takeshi‘s Castle or BBC's Total Wipeout. 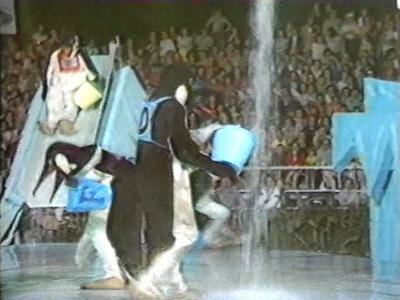 The national version of It’s A Knockout usually had between two and four towns each week competing in entertaining games that typically involved oversized costumes, props and water... sometimes lots of water ! 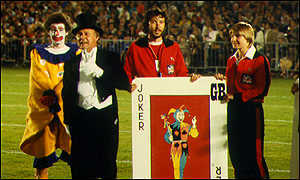 In the BBC and S4C versions the winning team usually then represented Great Britain in a European televised version called Jeux Sans Frontières, playing against the various winners of other countries regional heats in Germany, France and Spain etc. 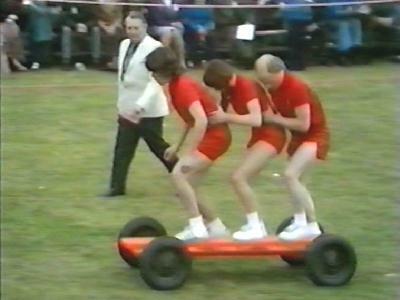 In the early days the games were more likely to be over sized school sports day type games. As popularity grew, so did the budget and style of games. 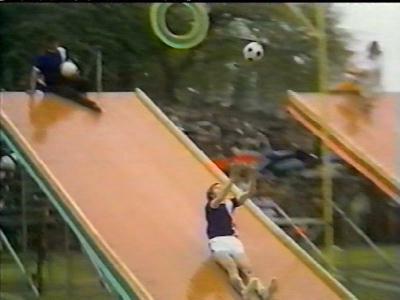 The types of games usually involved such tasks as collecting water over an obstacle course or dressing up in costumes (sometimes oversized) or walking across slippery poles suspended over an erected pool. 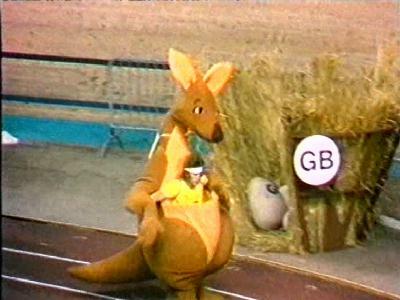 Programmes usually had a theme with the games based around the theme. 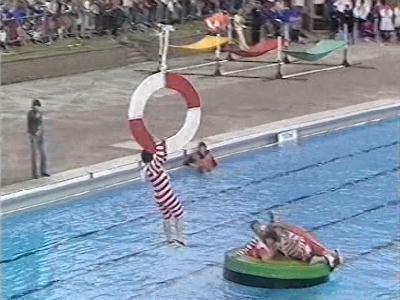 A number of programs were set solely in swimming pools, with games involving canoes, rafts and water bound assault courses. This site aims to chronicle just some of the fun and hilarity that this great television program captured. 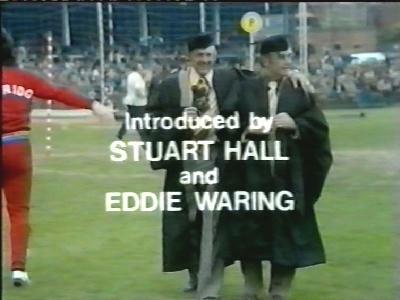 Although the BBC & JSF period of the shows history are the most fondly remembered by enthusiasts, this site also reflects on other versions such as the charity Royal Knockout and Channel 5 production. There are a few sites on this subject on the net, and we have chosen the "picture tells a thousand words" route here with more and larger sized images (many being screen captures of the shows). By no means is this site a definitive collection of the programs history just an edited high lights from an enthusiasts point of view.